This pantry had open shelving that was spaced so far apart there was a lot of wasted vertical space. The use of metal shelf additions just cluttered the look and did not provide flexibility to move products around. It gave the feeling of overwhelm with every shelf busting at the seams. So, the old shelves were removed and replaced with customized shelving. Not only did we gain space, but the results were calming to the eye upon entering the pantry. We don’t have any true ‘before’ photos, but we do have images of the empty shelves and images of the progress we made as we filled each shelf with the homeowner’s goodies! 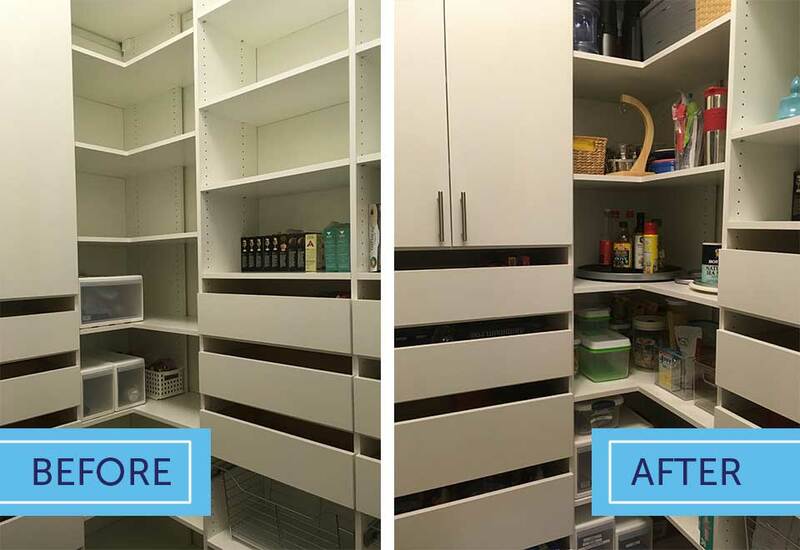 This client had the old shelving torn out and replaced with customized shelving and cabinets. What a difference in acquired space and even a space for the ladder! Drawers were installed to hold loose food products such as snacks, chips, nuts, etc. Tall cabinets that almost reach the tall ceiling helps to hide busy looking décor items such as candles, vases, light bulbs. The beginning of adding the products back onto the shelves. Cleaning products on the shelves with ladder in corner and vacuum and even enough room for overflow kitchen appliances. A turntable was used in this deep corner for bottled products (makes for easy access)and baskets and bins to hold paper products. Love “lazy susans” for this! Newer Post This Little Shoebox Office Gets Decluttered	Older Post Storage Unit Purge!